Archana was a student in AIC’s Education Outreach Program from late 2007 to mid-2012 when her parents covertly arranged her marriage. At the time, Archana was mid-way through Standard 10, her final year in secondary school, and was still too young to be married according to Indian law. Her younger sister also became a child bride at the same time; heartbreakingly, she was only in Standard 6. Knowing that child marriage is illegal, Archana’s parents kept the plan under wraps and the sisters simply stopped showing up for class at AIC one day. Archana had always been an exceptionally bright, promising student. She loved learning, and took her education very seriously. At the time that her marriage was arranged in August 2012, she was only months away from becoming the first Sikligar girl in our program to finish secondary school. Unfortunately, instead of looking forward to completing secondary school and starting junior college, Archana’s life took a tragic turn. My husband beat me a lot and was very violent. He always drank alcohol and forbid me from visiting my parents or family. He never earned any money and he used to gamble all night long. At night my husband would leave me in the room and wouldn’t come back until 4, or sometimes even 6 o’clock in the morning. At the time when our marriage was being arranged, everyone lied and said that he was a hard worker and had finished his education, but it wasn’t true. He had even been to jail before! After we got married, he never took care of me as if I was his wife. Everyone in the house used abusive language and beat me often for no reason. When I became pregnant, my husband used to threaten me and tell me that he only wanted a son. If the baby was a girl, he said he would kill her. And he constantly tried to extort money from my mother. He used to always brandish a knife when making these threats, and one time he beat me with a beer bottle. When I had to be admitted in the hospital at the end of my pregnancy, the doctors told me that unless my blood pressure could be controlled, I would have complications. But even then, my in-laws and husband said, “nothing will happen to her. We’re not going to keep her in the hospital.” Even then and there [in the hospital], my mother and mother-in-law got into a fight. When I delivered a son, I thought that finally my troubles would be over, but this wasn’t the case. In fact, things just got worse. 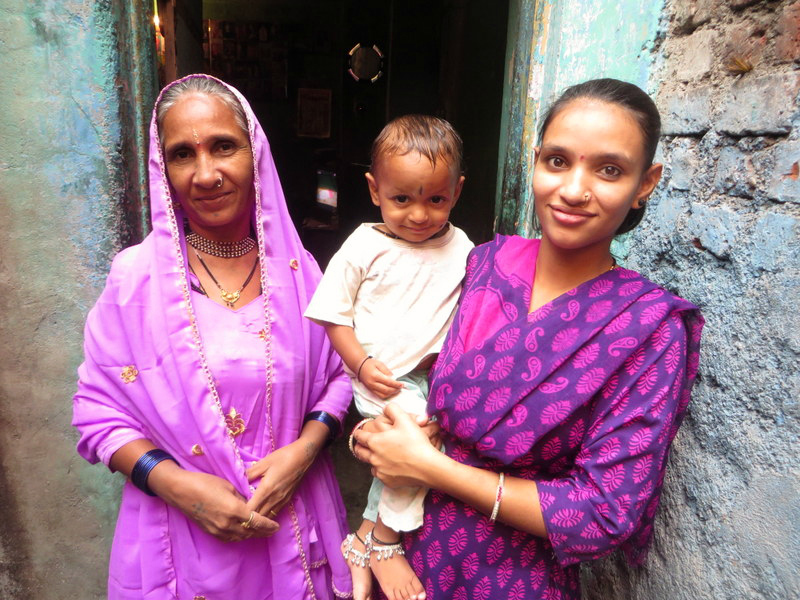 Archana’s son was born a month prematurely, weighing only 1.75 kilograms (3.8 lbs), perhaps resulting from a combination of constant stress, the heavy workload forced upon Archana at her in-laws’ house, poor nutrition, and non-existent prenatal care while pregnant. When my son was born, his weight was very low, but even then they refused to let me and the baby go back to my mother’s house to recover for a while. They even pressured my mother for money to pay for the medicine that I had been prescribed after my delivery and my mother handed over her mangalsutra (gold wedding necklace). Even then, they didn’t get the medicine for me. After that my mother came to call me for a festival in the community. At that time there was a huge fight and my mother realized how violent my husband was because she saw him beating me with her own eyes. In the fight that occurred, not only did he beat up my mother and me, but he even banged the door on my 14-day old son. At that point, my mother took me and brought me home. Archana lived with her parents and younger siblings for a period of time and was once again a familiar face at AIC, where she was receiving medical care and counseling for herself, as well as ongoing monitoring and treatment for her infant son. However, her husband and in-laws soon showed up again and when the community panchayat (tribal council) convened, it was agreed that Archana needed to give her husband a second chance. The panchayat promised that other community members in the area would be keeping a watchful eye to keep Archana and her son safe, and her in-laws gave assurances that Archana would not face further harassment and violence. Sadly, that was not the case. For six months, I stayed with my family. After six months, my in-laws came and said that it wouldn’t happen again, and they took me back with them. But even after that, there was no change in their behavior. For a few days, things were fine, but after that everything went back to the way it had been before. One time I was sitting and nursing my son and my husband came up behind me and tried to kill me with an iron weighing scale. Many times he threatened to kill me. He told me that he would kill me and dump my body in the canal near the house. The time that he beat my mother, we filed a police complaint. Archana and her family tried to have her husband arrested for attempt to murder, but the police refused to file any charge more serious than a complaint of domestic violence, which was then dismissed. In May, Archana returned to her parents’ house for a second time, and now vows to never return to her abusive husband. After I came back here, I found out that I was pregnant again. I absolutely can’t imagine going back there, so if I am going to be able to take care of my children, I need to finish my education to be able to stand on my own two feet. Only then will I be able to give my children a good future. For that reason, studying is very important to me and I am determined to finish my education. Archana is currently raising her 15-month old son, Jai, and is expecting her second child in a few months. Since coming back to AIC, she has rejoined school. 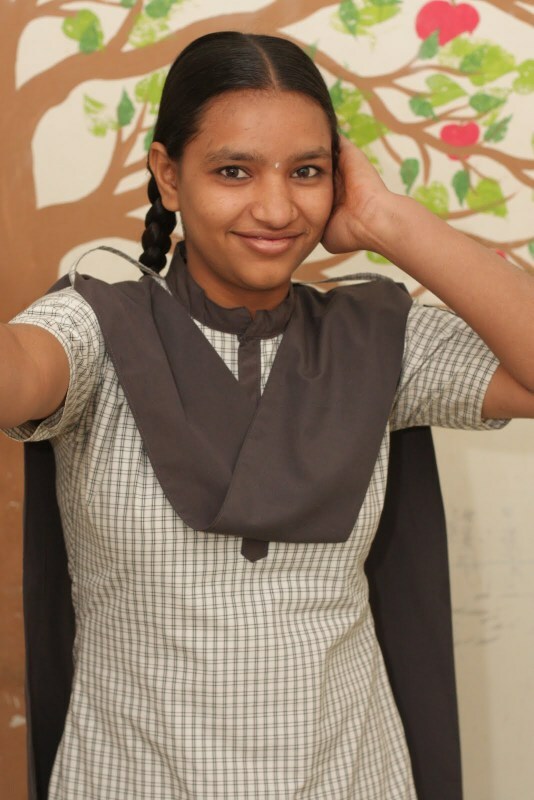 In addition to attending 10th standard classes in preparation for her secondary school board exams in the spring, Archana has been working as a classroom assistant at AIC for several months now. She helps out for an hour every evening, which allows her to earn a small stipend to put toward basic expenses for herself and her son. Though she faces taunts and pressure from community members, who feel that it is inappropriate for a girl who has married to be continuing her education and working (both scenarios are taboo in Sikligar culture), Archana has adopted a defiant stance. I don’t care about them. Did they care about me when I was in deep trouble? No. Then why should I be bothered by what they think? 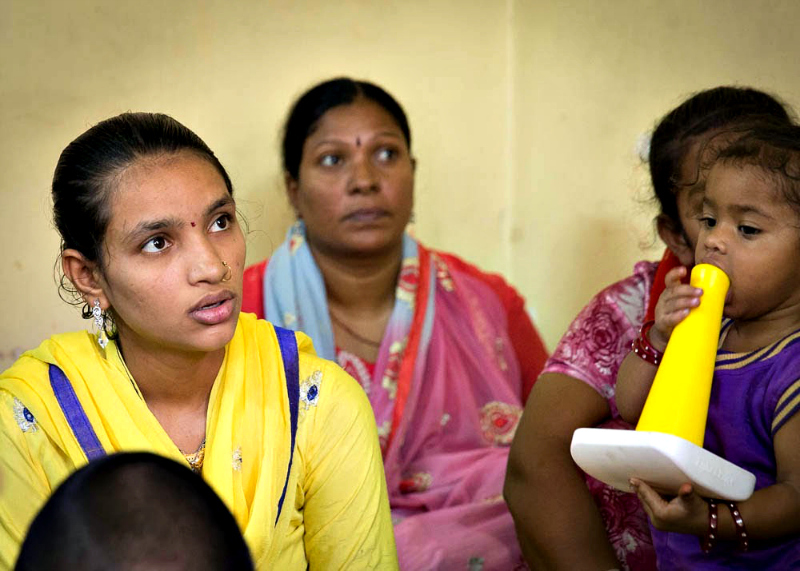 Archana also attends Mother-Baby classes at AIC with Jai, where she often helps out with recordkeeping and teaching basic literacy skills to fellow young mothers, and receives prenatal care, supplemental meals and food through the AIC Health Outreach Program. Perhaps the most valuable thing Archana receives at AIC is receiving is the support of teachers, staff, and mentors, without which she believes she would probably not be able to face the pressure and would have returned to her in-laws. 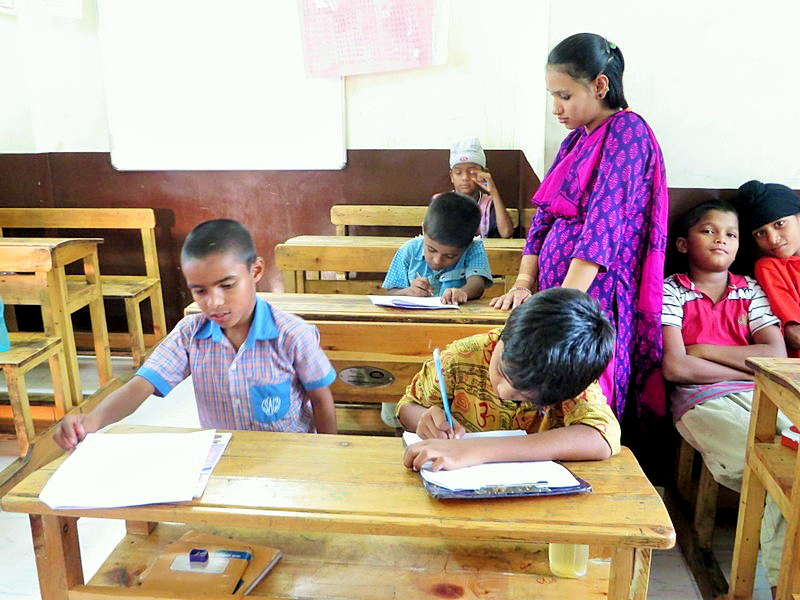 She has particularly gravitated toward Suchitra, a member of AIC’s counseling team who has known her since Suchitra joined in AIC as a teacher in 2008. Prior to Archana’s marriage, Suchitra had been Archana’s teacher, and having known each other for many years has allowed Archana to trust Suchitra as a tireless mentor and staunch supporter. My mother is a huge support to me. But when I become depressed and feel like everything is hopeless, I speak with Suchitra didi and I regain the strength to continue fighting. 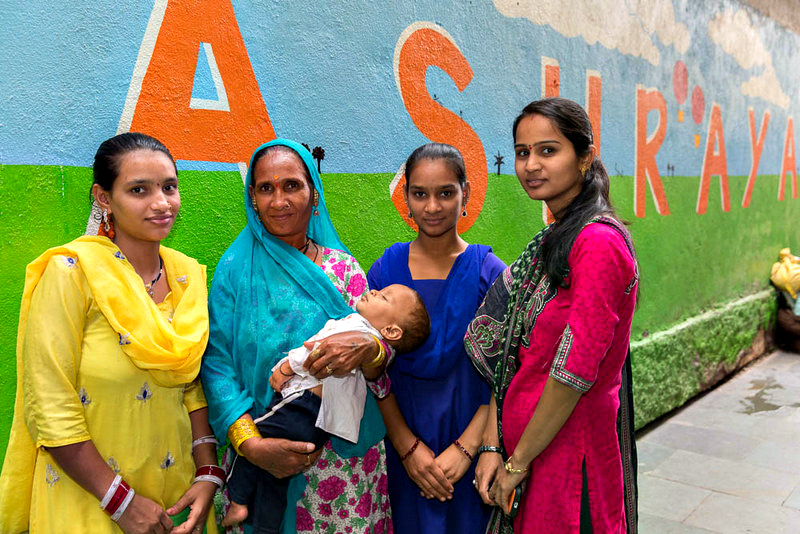 With the support of Suchitra and the rest of the AIC team in Pune, Archana has found the fortitude to begin to dream about her future and her children’s future, and is doing everything she can to realize her goals. Based on the experiences that I have had, I can say one thing with certainty: I will not give my children a life like mine…My dream is that my children will be different from all other Sikligars. I will not impose any of their rules and restrictions on my children and I will encourage them to study a lot. I will definitely give them the love of both a mother and a father, and after they’re grown they’ll feel nothing but pride that their mother overcame such obstacles to raise them. I have faith that I can do a good job caring for them by myself. I will study and make something of my life, and I will give my children the best education possible. If my second child is a girl, I won’t raise her like I was brought up. I won’t have her life controlled by rules and restrictions. And I’ll raise my daughter exactly as I will raise my son. I’ll give both the best educations possible and a good upbringing. Archana’s situation is extreme but unfortunately, not as uncommon as one might hope. Of the 200 students in AIC’s Education Outreach Program, she is not the only student who was married as a child and has since rejoined the program to finish her education, and she is certainly not the only one whose life has been marred by abuse and brutality. Within the Waghri and Sikligar communities, there are countless stories like hers in which child marriage, shattered educational dreams, early motherhood, and unspeakable violence have had devastating effects on the lives and futures of adolescent girls. Globally, she is one of millions of girls married off too young, who are forced to exchange their educations for abuse and early motherhood. Sadly, Archana’s story is perhaps most unique in that she has been one of the few who have been able to walk away from circumstances that would have likely killed her otherwise. 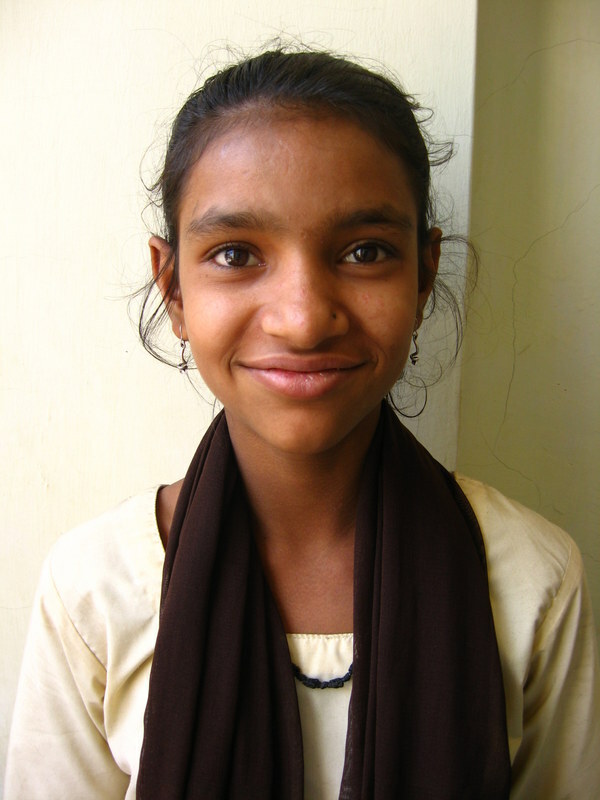 On International Day of the Girl Child, experiences like Archana’s should give us all pause. No teenage girl should have a story like hers to tell. As a community, as a country, as a world, we can and must do more; it’s what girls like Archana are entitled to as fundamental human rights to life, freedom, and education, and what our world needs to ensure that girls and women everywhere can reach their full potential. One day, we hope that there will be no more stories like Archana’s to tell.